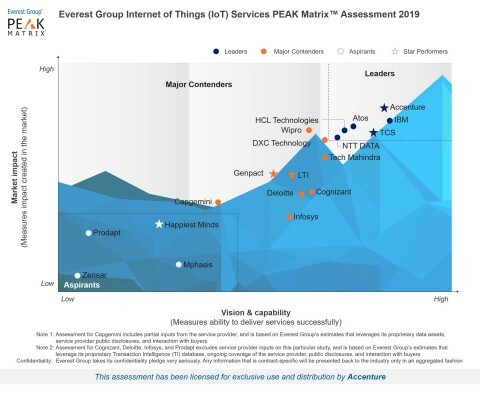 Accenture (NYSE:ACN) has been named a Leader in the Everest Group’s Internet of Things (IoT) Services PEAK Matrix™ Assessment 2019 report for the third consecutive year. It received the highest marks in the Market Impact category and was named a Star Performer based on based on year-over-year growth. Everest Group highlighted Accenture’s end to end IoT capabilities, strong ecosystem of partnerships and global delivery capabilities. The analyst noted that, “Accenture is making investments to connect clients with academia and industry experts, thereby enabling its clients to address key business issues.” A distinguishing feature of Accenture’s 2018 market success is its customer intimacy and partnership approach, which leads to high client satisfaction, according to the report. The Everest Group’s PEAK Matrix™ assesses the relative market success and overall capability of service providers. For this report, Everest Group evaluated 19 leading service providers for their IoT capabilities based on various criteria, including infrastructure security, device and sensor engineering, platform integration, and applications and data analytics service. Accenture is a leading global professional services company, providing a broad range of services and solutions in strategy, consulting, digital, technology and operations. Combining unmatched experience and specialized skills across more than 40 industries and all business functions — underpinned by the world’s largest delivery network — Accenture works at the intersection of business and technology to help clients improve their performance and create sustainable value for their stakeholders. With more than 469,000 people serving clients in more than 120 countries, Accenture drives innovation to improve the way the world works and lives. Visit us at www.accenture.com. Accenture Industry X.0 helps businesses master the digital reinvention of industry when they use advanced digital technologies to transform core operations and unlock new revenue streams and business models. We support every aspect of our clients’ multi-phase transformation including workforce, customer experience, R&D, engineering, manufacturing, business support and ecosystems. Visit https://www.accenture.com/industry-x0.